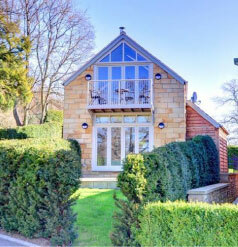 Carr Mount Estate holiday accommodation offers superb, luxury facilities in 4 unique Whitby properties split across our cottages and Whitby town property. Each holiday accommodation has its own character and charm and all are equipped and furnished to an extremely high standard. The Barn and The Cottage can be booked together and used as one property for larger groups / events — as they use the same entrance hall. To view availability for both properties together, please visit our Rates & Booking Info page and select ‘The Barn Cottage’ from the dropdown menu. 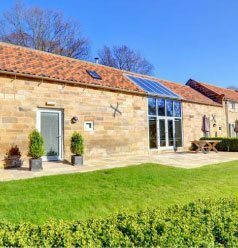 Our luxury holiday cottages are situated between the picturesque villages of Sleights and Ruswarp in Whitby. Both villages offer a number of shops, in particular in Sleights the famous Bothams Bakery is a place to indulge yourself and in Ruswarp Jacksons Butchers offers an excellent selection of local meats, pies and other products. All 3 units can be booked together to offer accommodation for up to 12 people – all of whom can be easily seated around the table in the barn to enjoy your special celebration meal. 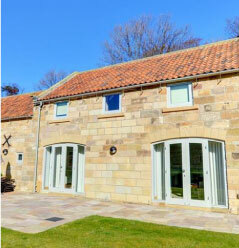 The Barn is a superbly appointed holiday accommodation offering open plan living, comfy sofas, dining area and kitchen, patio doors leading out onto paved and lawned area with outside seating. This property also offers disabled access and ground floor wet room facilities. This holiday Cottage has joint access with the Barn accommodation and is also newly refurbished to an excellent standard offering a quiet haven to relax in. The Byre is situated in its own grounds behind the Barn and Cottage accommodations and offers that special intimate accommodation for a romantic break for 2 people. No 9 is situated on the second floor of Whitehall Landing a new riverside development situated on a former shipyard on the east side of the historic town of Whitby. It is a 10 minute walk from the extensive amenities of the town along a riverside pathway. 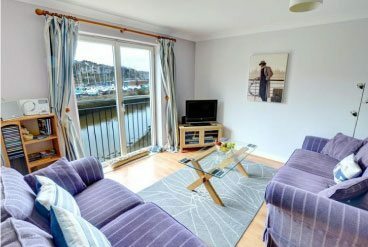 Our Whitby town property offers a unique holiday accommodation venue in this long established popular destination. Squeezed between the sea and the North York Moors, Whitby has guarded its identity and maintained its historic charm. With unique architecture, a maze of narrow cobbled streets and winding alleyways it offers an experience for all ages.